The Graduate has graduated. It’s about time a woman director grabbed hold of Terry Johnson’s stage adaptation and shook something more satirically and sexually relevant from it. Based on the novel by Charles Webb and the 1968 film, it concerns Mrs Robinson’s seduction of young middle class rebel without a cause, Benjamin Braddock. Despite introducing video and sound sequences to highlight Benjamin’s repressed fantasy life, Lucy Bailey’s insightful new, superbly played production can’t disguise the annoying cuteness that permeates Johnson’s script, especially its cheery ending. Mike Britton has created a setting dominated by a double bed that’s all swishy net curtains and minimal 1960s chic to provide a sort of smart camouflage for the plastic-coated social strata that Benjamin attempts to resist in favour of what he calls “ordinary people who don’t have big houses”. 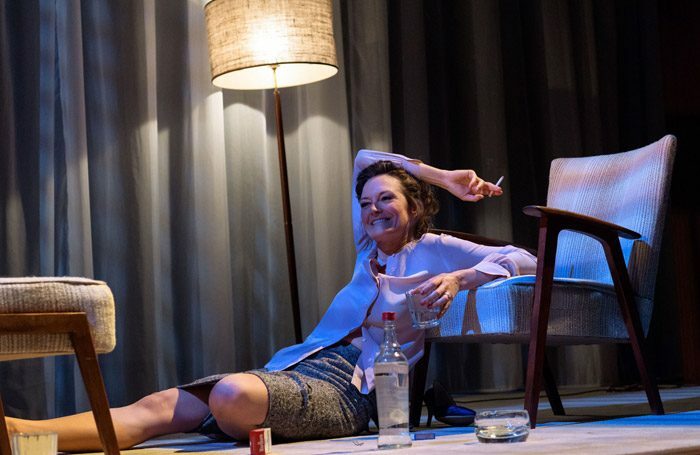 There’s startling grotesquery too in Catherine McCormack’s brave unzipping of Mrs Robinson as a deeply unhappy lascivious alcoholic, rancid with destructive booze and nicotine, a living picture of a privileged but un-liberated 1960s woman. Seducing Benjamin is the only power she has left. By contrast, her betrayed daughter Elaine – a gutsy Emma Curtis – is the only character to graduate with honour.